Dog, on cue, will move to the opposite side of a suitable object (e.g. orange soccer cone) at designated distance from the handler, and wait for a count of three seconds. Level 1: Object is 10 feet from the handler. Elapsed Time must be 10 seconds or less. Level 2: Object is 20 feet from the handler. Elapsed time must be 20 seconds or less. Level 3: Object is 30 feet from the handler. Elapsed time must be 30 seconds or less. All levels require the dog to move, on cue, from the handler’s side in a clockwise or counter-clockwise direction and pause on the opposite side of an appropriate target object (e.g. orange soccer cone) for a count of 2 seconds. Each level then calls for the dog to respond to additional cues. Handler may use a verbal and/or visual cue to the dog, but cues/directions may not be repeated. The handler may give one cue to begin movement and another to end it. Level 1: Two targets are used, 10 feet in front of the handler and 10 feet apart. The second cue from the handler requires the dog to move in the same direction to the second target and again pause for a count of 2 seconds. Elapsed time must be 30 seconds or less. Level 2: Three targets are used, 15 feet in front of the handler and 10 feet from one another (total horizontal distance = 20 feet). The second cue requires the dog to move again in the same direction to the second target and pause for a count of 2 seconds. A third cue from the handler requires the dog to move again in the same direction to the third target and pause for a count of 2 seconds. The exercise is to be completed twice: once with movement in a clockwise direction and once in the counterclockwise direction. The dog must successfully complete both directions. Elapsed time must be 45 seconds or less per direction. Level 3: Three targets are used, 15 feet in front of the handler and 12 feet from one another (total horizontal distance = 24 feet). Elapsed time (total) must be 60 seconds or less. Tests the ability of the dog to appropriately propel a ball toward the handler and what would be, in a Game, the goal area. The dog must use accepted methods of pushing, i.e. with nose, top of head, chest or the top of paws. Biting the ball is not allowed, nor is the dog allowed to “ride” the ball with legs or forequarters resting on the ball at any time. The exercise begins with the dog sitting, standing or in down position on the opposite side of a ball from the handler; the exercise does not include a “send” or any directional cue. Elapsed Time begins at the Handler’s cue for the dog to push. 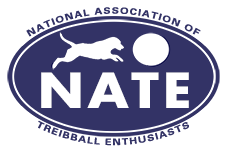 Balls must be of a size appropriate to the height of the dog, per NATE Game Rules. The Handler must remain within the Handler’s Area. However, the Handler may reach out to “catch” a ball that is passing to the side. The Handler may not use a staff or other artificial item to assist this maneuver. The exercise is finished when the ball is within the Handler’s Area, or when Elapsed Time is met, whichever comes first. Elapsed Time at all Levels must be 20 seconds for Mini and Extra-Small competitors, 15 seconds for Small, and 10 seconds for all others. Ball is placed 15 feet from the front line of the Handler’s Area. The Handler’s Area shall be 10’ wide and 5’ deep. Ball is placed 25 feet from the front line of the Handler’s Area. The Handler’s Area shall be 12’ wide and 5’ deep. Ball is placed 40 feet from the front line of the Handler’s Area. The Handler’s Area shall be 15’ wide and 5’ deep. NOTE: Toys or food may be visible to the dog during Distance or Directional Commands tests, but not on the Handler’s person. No rewards should be visible to the dog during Pushing tests.